The dead period may be a quiet time for college coaches around the country, but many recruits are busy at some of the top prospect camps in the world. The exposure from these camps allow for many players to update the status of their recruitment while showing off their skills too. 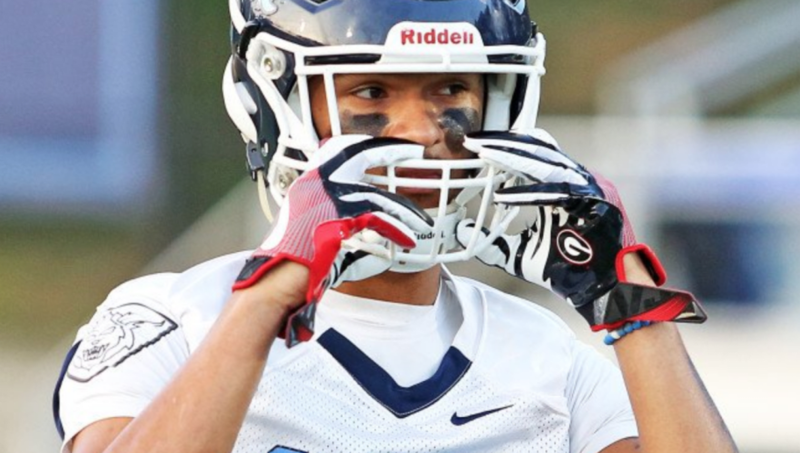 Jadon Haselwood is the nation’s top receiver in the 2019 class. He has been committed to Georgia for 16 months, but that hasn’t stopped other schools from pursuing him. And one of the schools pushing the hardest for him has been Tennessee. Tuesday, he told SBNation’s National Recruiting Analyst Bud Elliott that “Auburn, Oklahoma, Tennessee, Florida State, and Miami,”are the schools trying the hardest to flip him right now. Tennessee’s previous coaching staff offered Haselwood back in 2017, and he took an unofficial visit to Knoxville back in February. Despite his commitment, he has still shown interest in the Vols. “I’m solid until further notice,” he told Elliot, meaning his recruitment may not be over after all. Tennessee may be able to get him on campus this fall, and if they can, it could go a long way toward flipping his commitment. He already plans on visiting Georgia, Oklahoma, Miami and Florida State. Tennessee and Auburn will be competing to fill his fifth official visit slot. From what we know about the Vols’ new offense, they prefer bigger, physical receivers who can block as well as catch. That accurately describes Haselwood based off his high school film and his time at The Opening. Haselwood stands at 6-foot-2, 195 pounds, which is a pretty good frame heading into college. The five-star is the No. 6 player in the country, top player at his position, and top player in the state of Georgia per the 247Sports Composite rankings. He plays football at a very high level, as there really isn’t anything he doesn’t do well. He is a natural playmaker and isn’t scared to assert himself in a game. He is great at beating press coverage and has elite body control. He is a fluid athlete and can make get those extra yards after the catch. His biggest weakness right now is his route running ability, but that can be taught. He also plays defensive back for Cedar Grove High School, and he’s good at that too. Though he was never that high on the Vols when Butch Jones was still coaching, he has developed a relationship with Jeremy Pruitt that dates back to when he was at Alabama. When he visited UT in February, he reportedly left with a very positive impression. He and receivers coach David Johnson have gotten along very well. Tennessee offensive tackle commit and fellow five-star Wanya Morris was trying to recruit him this week at The Opening, and the two are good friends. While Tennessee is currently considered a longshot, they aren’t out of it yet. If they are able to put a good product on the field this season and secure an official visit from him, then they might just be able to sway him. He would certainly help solidify a receiver class that is already shaping up to be a strong one for the Vols.